Ullswater is one of the prettiest lakes in the Lake District. Covering an area of over 880 hectares it is also the second biggest, beaten only be Windermere. It is also the only lake in the area with three separate reaches. The biggest villages on Ullswater are Glenridding and Pooley Bridge. Glenridding is situated near the southern tip of the lake while Pooley Bridge at northern end. Glenridding is a popular base for walkers tackling Helvellyn while Pooley Bridge is a charming village with a good selection of campsites and caravan parks. Other settlements on and around the lake include Patterdale, Dockray, Watermillock, and Howtown. 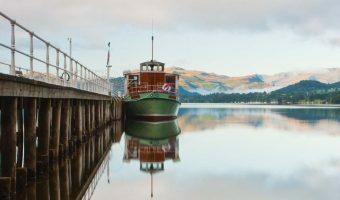 One of the best and quickest ways to explore the lake is to take a cruise on one of the Ullswater Steamers. The boats operate almost every day of the year, calling at Pooley Bridge, Howtown, and Glenridding. Visitors wishing to get onto the water themselves can hire motor boats, canoes, and kayaks from various operators around the lake. Options include the Glenridding Sailing Centre and St Patrick’s Boat Landing, both in Glenridding, and Lakeland Boat Hire in Pooley Bridge. 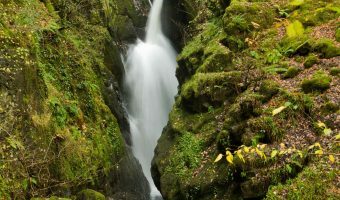 Aira Force is one of the most spectacular waterfalls in the Lake District. Visitors can walk right up to the base of the waterfall and feel the spray in their faces or admire the view from the bridge above. Glencoyne Park, south west of Aira Force, was where William Wordsworth and his sister saw the daffodils that inspired I Wandered Lonely as a Cloud, arguably the most famous poem ever written. The flowers are still there today and usually blossom in March. Glenridding is a walker’s paradise with many excellent routes to choose from. The most rewarding, and most hazardous, is the trek up Helvellyn via Striding Edge. Walking along the top of the Striding Edge ridge requires a head for heights, but there’s a slightly less daunting path just off the crest. The lakeshore stroll from Howtown to Glenridding was one of Wainwright’s favourite walks. Most people doing the walk today combine it was a trip on one of the Ullswater Steamers. Penrith is just 6 miles from the head of Ullswater. Attractions in and around Penrith include Penrith Castle, Rheged, the Settle to Carlisle Railway, and the South Tynedale Railway. Further information about all these attractions and more can be obtained from either Pooley Bridge Tourist Information Centre or the Ullswater Tourist Information Centre. 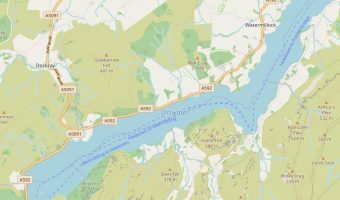 Many of the accommodation options around Ullswater can be found on the western shore near Watermillock and Dockray. Choices include the Brackenrigg Inn, Rampsbeck Country House, and Macdonald Leeming House. Another popular choice is the Inn on the Lake at Glenridding. 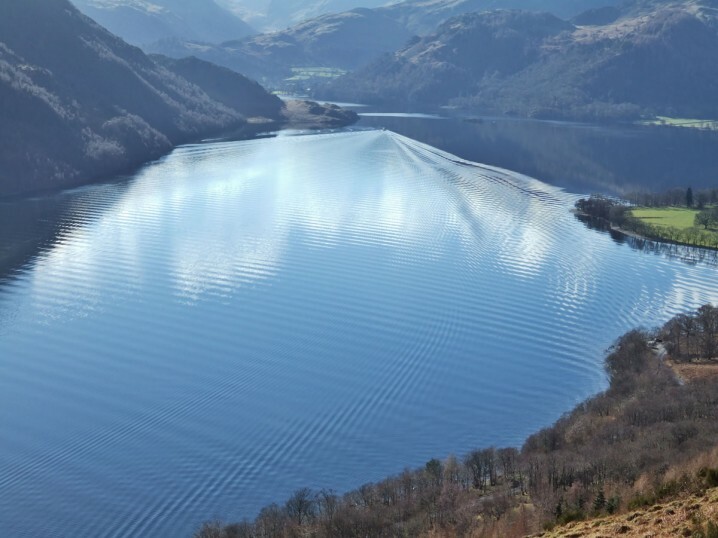 Ullswater boasts a good selection of campsites and caravan parks. Sites at the northern end of the lake, near Pooley Bridge, include Park Foot, Waterside House Campsite, and Waterfoot Park. All these sites are family-orientated and boast a wide range of facilities such as shops, children’s playgrounds, restaurants and bars etc. Further options can be found on the western side of the lake around Watermillock. The Quiet Site is an award-winning site that accepts caravans, motorhomes, and tents. It also offers a number of camping pods. Facilities here include a shop, children’s playground, laundry and washing room, public telephone, electric hook-ups, and free wireless internet access in certain areas. The bar is housed in an old barn and boasts an open log fire, pool table, and games room. Other campsites nearby include Cove Park and Ullswater Holiday Park. Sites at the southern end of Ullswater include Gillside Caravan and Camping at Glenridding and Sykeside Camping Park near Brothers Water. The A592 runs along the western shore of Ullswater, connecting it with Penrith to the north and Windermere and Bowness to the south. The route from the south involves going over the Kirkstone Pass, the highest open road in the Lake District. With an altitude of almost 1,500 feet above sea level and gradients as steep as 1 in 4 it is frequently closed in the winter. The Lake District National Park Authority operates pay-and-display car parks in both Glenridding and Pooley Bridge. The 108 (Patterdale Bus) runs between Penrith train station and Patterdale, just south of Ullswater. Stops on the route include Pooley Bridge, for Aira Force, and Glenridding. The 517 (Kirkstone Rambler) operates in the summer and travels between Bowness and Glenridding, calling at Windermere train station, Troutbeck, the Kirkstone Pass Inn, Brothers Water, and Patterdale. The nearest railway stations are Penrith and Windermere. Pooley Bridge is 6 miles from Penrith railway station and 21 miles from Windermere railway station. Glenridding is 13 miles from both Windermere and Penrith.